COLUMBUS, Miss. – Anna Kate O'Bryant, a freshman from Columbus, is the 2017-2018 recipient of the MUW Alumni Association Legacy Scholarship. This scholarship is awarded to an entering full-time student who is a family member of an MUW alumna or alumnus. She comes from a long line of W graduates including her mom, Jill Daffron O'Bryant '95; great grandmother, Martha Daffron '65; great aunt, Patricia Daffron Kelly '58; and several cousins. She said she made the right choice in coming to The W.
"I have enjoyed my time at The W so far. It meets my academic needs and my athletic goals. Receiving the Legacy Scholarship has made it possible for me to continue my education and work toward my future," said Anna Kate O'Bryant. She intends to graduate from The W with a bachelor's degree in business administration with an in emphasis health care management. "I plan to find a job here in Columbus at the hospital or a clinic where I can use my skills to work on the business side of health care," she said. Anna Kate O'Bryant's mom, Jill Daffron O'Bryant said The W has been an important part of her life for many years. Graduating from The W in 1995, and working for the university for more than 21 years, she was excited for her daughter to continue the legacy. "It was a very proud moment for me when Anna Kate chose to attend my alma mater and especially when she signed to play softball for the Owls. It also was an honor for her to be chosen for the Legacy Scholarship. From my grandmother to my aunt and cousins to myself and now Anna Kate, we have a long line of W girls," she said. "I'm so pleased Anna Kate is now part of The W family and will be able to experience some of the same things I did as a student. The W truly is a special place!" Anna Kate O'Bryant said The W has always been a special place to her and made her choice easy. "It is very close to home, which I enjoy. I also decided on The W because of the start of the softball program, which I am a member of. I knew I was destined to come here when I heard about softball coming back my freshman year of college," she added, "It's like it was meant to be!" She said her favorite part of being on campus has been the atmosphere. "Everyone is so friendly and welcoming, especially when I first got here as a freshman a couple of months ago. I was very nervous about the change from high school to college and was scared I wouldn't know anyone. On the first day, though, I was welcomed. It feels like home." MUW Alumni Association President, Courtney Murtaugh of Barrington, Ill., said the MUWAA is pleased to award the scholarship to O'Bryant. "Anna Kate is an outstanding student and athlete. 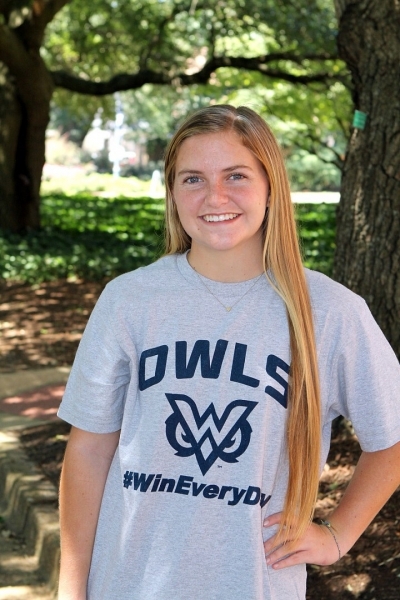 She comes from a very long line of MUW Alumni and she possesses the characteristics necessary to be a leader at The W both in the classroom and on the athletic field," she said. Recipients of this award complete an extensive application process which provides a student's complete resume, including academic achievements, extracurricular activities, work and volunteer activities, a letter of recommendation from a high school teacher or counselor, and a short essay on why the student has chosen to attend The W.
The MUWAA exists to support and promote the mission of The W while providing alumni engagement opportunities. Any former student who has completed at least twelve (12) semester hours at the university and who has made an annual contribution to the MUW Foundation is an active member eligible to vote and hold office for the year. For more information, visit the Mississippi University for Women Alumni Association website at https://longblueline.muw.edu.